I was very much aware of Baron Dark and his cohorts from the 1990s Skeleton Warriors line, in part because it was during that glorious period where Playmates and other toymakers tried to make something for kids that also would be of a higher quality for older collectors. It worked for Star Trek, so it made sense to try it elsewhere. Well, it didn't work, but October Toys licensed the brand as a collector run again - 1:18 scale Glyos figures - and you know what? It worked nicely. We haven't seen a second character yet, but the first one is good. I'm a fan of October Toys. They host the Glyos forum, and put good stuff out - it's one of the few companies where I feel a strong need to try anything they make because, generally speaking, it's good, cheap, and the outfit is run by nice people. I was totally OK waiting a few extra months for the Bone Titan Skeleton, a 5-inch super-articulated figure created, I assume, to share tooling with Baron Dark in order to get a little more bang for the tooling buck. I did the Kickstarter to get the Baron, this Skeleton, the glow version, and a Skeleden - and that seemed like enough. I now regret skipping the clear blue one, because the Titan Skeleton mold is quite good and because these were intended to be scaled to 3 3/4-inch figures, it's the perfect nemesis to the Jakks Pacific Link figure from the Zelda games as well as other fantasy lines in this scale. Which I am now blanking on, I'm sure there must be another one - but hey, it's a good fake Stalfos. I'm a fan of the design, and while I don't buy all the new versions I had to snag Rykurra Sarvos because the coloring reminded me a bunch of this very site. The paint masks have been changing slightly with each new release, and this time around we see a new painted space on each side of the torso - you can notice more splashes of maroon, plus a slightly different paint job on the head. The "mouth" is painted, but the face isn't. The Crayboth Marauder MK II is a redesign of one of the first five boxed two-packs from many many years ago, joining the Disruptor and the Standard on the remake train. 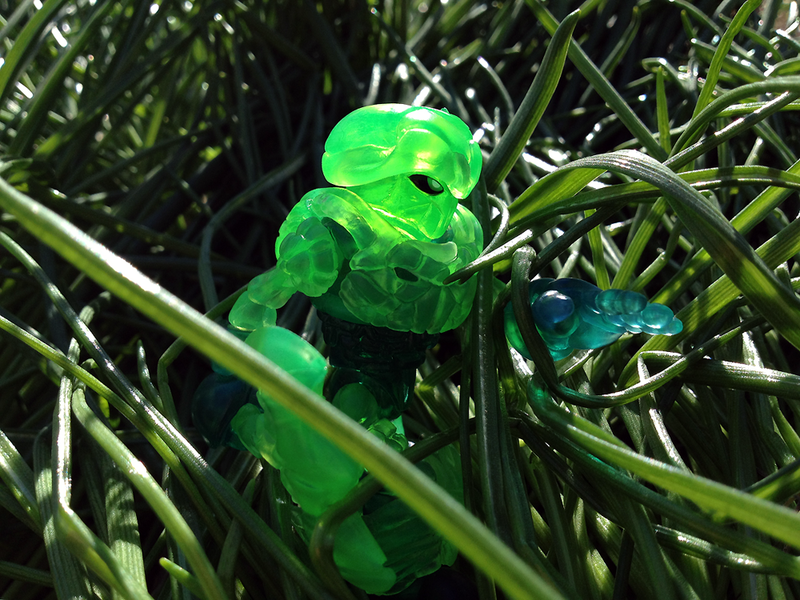 After a slow initial roll-out, the Crayboth figures are some of the most collectible in the Glyos toy world thanks to a number of unannounced, undisclosed freebie figures of which I even no longer have a complete set - sometimes you get one, and sometimes you don't. Thankfully those are unpainted, so for some of the best designs you actually have a shot at requesting them. Return of Skeleden - plus Neo Granthan, Crayboth, and More! I missed the drop so this is an incomplete menu, I'm sorry to say. Click here to see the May 4 2015 Onell Design drop menu. Click here to order what's still available. Coming Monday - 9:30 PM EDT is a mini drop! Click here for the scoop at Onell Design. So far we're looking at Ultra Bronze accessories and a Green Skeleden, and then... we're not sure yet. Stay tuned for more!